If you listen to NPR, you’re likely familiar with Scott Simon, host of Weekend Edition. In his new memoir Baby We Were Meant for Each Other, Simon shares his own experiences adopting two girls from China, his daughters Elise and Lina. In addition to sharing his own story, Simon highlights moving tales from a dozen other families, including sportswriter Frank Deford and Freakonomics author Steve Levitt. Simon mixes pathos and humor and his detailed, unflinching narrative is deeply emotional without ever coming across as maudlin or mawkish. While an argument for adoption seems to be relatively common sense, Simon reveals that the process is declining in America, largely because of advances in fertility science. He also makes an impassioned case against China’s one-child policy as a human rights crime against women. In a recent profile at Bookpage, Simon said “The Chinese permit an astonishingly small percentage of orphaned and abandoned children to be adopted. To me, that is absolutely flabbergasting. The government policy on adoption is addressing political, economic and social goals that have almost nothing to do with the best interests of children. Now that we have two little girls from China who are part of our family, we need to speak out about it.” At first glance Simon’s memoir will likely resonate mostly with those who’ve experienced adoption first-hand, but a closer look reveals a narrative that taps into an experience that we all share–what it means to part of a family. Baby, We Were Meant for Each Other is new in hardback from Random House. Lower adoption rates is not a fertility issue. It is simply easier and less stressful for a family to adopt a baby from China than to provide a home to a foster child through the state and federal programs. Especially here in Virginia, it is easier for localities to lock the children up in for-profit residential centers than to oversee adoption in a loving home. It’s not less expensive, the cost of residential runs up to $1,000 per day, per child, but it is a choice left in the hands of Virginia’s social service “workers,” the majority of whom have no training or experience in social services. In Virginia, as in many states, DSS workers are only required to have a college degree, any field is acceptable. We had a local worker with a degree in Home Ec. These “social workers” then are charged with making life and death decisions for children and families. But easier and higher levels of funding are provided if the foster children are locked up in residential placements, such as those owned by mega corporations such as Psychiatric Solutions Inc. and Universal Health Services. The local workers know if the child is locked up until they are 18, the worker will not be bothered with pesky middle of night phone calls and parents trying to access better services for their special needs children. I appreciate the wish to improve services in China, but believe we might look at ourselves first. Daily in the United States, foster children (as young as 4 – way past the cute baby stage) are assaulted, beaten, starved, molested, raped and killed in facilities owned by multi-million dollar corporations such as Psychiatric Solutions Inc. and Universal Health Services, all well documented by multiple state and federal agencies. This is a story NPR needs to cover. Special needs foster children in the U.S. tend to have bad hair cuts, pimples, and attitude and are not quite as photogenic as the fat, adorable Chinese babies, but inside their hearts and need for a loving family are the same. I don’t believe there is a single obnoxious foster teen or young adult, or even older adult, who still doesn’t dream of finding a loving family to call their own. Wouldn’t it be great to find homes for all these children? The money is there, just being wasted on for-profit residential placements across the country. What we owe all children in foster care, where ever they are from. I caught Scott Simon on the radio this morning he was speaking how his wife had noticed some latinos observing that their child had eyes which are associated with Asians (almond eyes). Well Scott sometimes we find what we are looking for even if it is not there. Scott assumed there was something derogatory in their stares. Let me suggest as a man who married a woman from Guatemala with a son who married a woman from San Salvador who has almond eyes and a baby with almond eyes that the latinos involved might have been wondering if your child was latino as latino children are commonly adopted in the US. I too am glad his wife observed this as he would probable ended up with egg on his face. I am disappointed that the host of the program did not call him on this issue. One of my brother-in laws could pass as Chinese as he has almond eyes. Oh what you hear on radio when you don’t have yur cell phone. Below is an excerpt from my longer review of Simon’s book: See my blog to read more. Certainly, adoption transforms lives – the lives of the children adopted, the parents who adopt, and the birth families and mothers who experience a significant, perhaps irreparable, loss. Simon’s view of adoption diminishes the complexities, loss, inequities, and struggles that are part of the process of transformation that occurs, whether children are adopted internationally, transracially, or domestically. While Simon acknowledges some of the “big” issues of transracial adoption, he fails to investigate them adequately, and more importantly, the potential deeper analysis that might come from his story is lost in the glossing over of the realities of adoption. 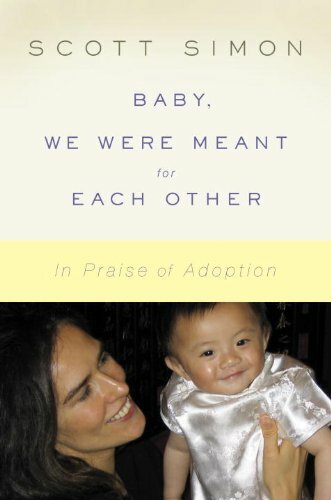 Simon’s assertions about the “miracle of adoption” closes the door on valuable and significant discussion about a nuanced subject, especially for those adult adoptees who feel isolated, misunderstood, or damaged by families that were ill-equipped to handle the racial divides of Unites States culture. What I can say is that I have wrestled with feelings of the inequities of adoption, and far from feeling like a savior, I feel as if I could have done something more for Monkey Man and Gorilla Girl, it might have been to make things in the world right, so that each of them could remain in the families they were born to. It is a strange world when the misfortune, sorrow, and poverty of one leads to the fulfillment of long-held desires for another. In the end, Simon’s book provided an opportunity for me to open a new door, to examine again how I will participate in helping Monkey Man and Gorilla Girl to navigate the murky waters not only of adoption, but of racial difference. I can’t shake Simon’s assertion of adoption as miracle, and can’t seem to dislodge the dissonance I feel when I think of adoption in those terms. Miracles are divinely inspired. Adoption is culturally determined and created; human being carve out families from disparate circumstances. I come back to transformation. Adoption has the potential to transform: families, individual lives, communities, and perhaps the world. However, the trauma of adoption has to be held in one hand while the possibilities are held in the other. Very classy, Necessity. You know, you’ve given me a great idea. How about I go to your blog and post links to *MY* reviews all over the place in lieu of, I don’t know, making a genuine comment. You do understand that this is as bad as spam, right? If you wanted to link your review to my review of Simon’s book, I would have no problem with that. You could also set your blog to moderate comments — you could have denied my comment in that case. I was frankly surprised that my comment appeared instantly.